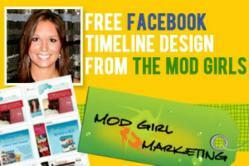 Mod Girl Marketing is helping small businesses increase their online exposure yet again with an exciting new sweepstakes to win a free premium Facebook Timeline design. At the end of March, all pages will switch to the new Facebook layout automatically, leaving many business owners scrambling to adapt. Get your new page now by calling 816-348-3789 or by entering the sweepstakes at http://www.facebook.com/mod.girl.marketing. On March 30th, all Facebook pages will change as we know it. Facebook is unveiling a completely different layout for all pages - including individual profiles and business pages – with Timelines for business pages that allow for more images and better branding opportunities. There will also be new regulations prohibiting brands from making overt calls to action in their cover photo -- such as “like our page” with arrows pointing to the “like” button or including contact information in the cover photo spot. While the new Timelines for business pages may seem confusing at first, Facebook spokespeople say it will ultimately be a positive change for companies. Brands may now choose a “cover” photo, which is the prominent banner across the top of the page. They can also run their own contests, feature videos, choose what topics of conversation remain at the top of the page as a memo for up to 7 days, showcase the company’s history in a timeline that dates back to the company start date, mark important milestones and achievements, star important posts to be more noticeable, and create Groupon style offers. Given all that Timelines for business pages can do, it’s important that companies take this time to reassess their social media designs going forward to avoid a clunky transition period. Now businesses have a chance win one of 3 Free premium Timelines for business pages! Mod Girl Marketing LLC, a full service online marketing company based out of Kansas City, Missouri, is offering this exciting new sweepstakes to help businesses continue seamless social media operations, despite the inevitable change to their Facebook layouts. Revamping of timeline data to feature prominent content and create an all-around attractive display. That equates to a $400 value. “Change is coming, no matter what,” says President Mandy McEwen, “so why not get one of our Timelines for business pages absolutely free?” She emphasizes that the Facebook Timeline designs her company offers are premium because they are made by professional graphic designers who not only have a flair for aesthetics, but who also have a toolbox of special features and a strategic perspective to help businesses adapt to the new changes. “If you haven’t thought about running a sweepstakes or daily deal, now might be a great time to talk with our online marketing experts about what has been working for other businesses and what might be an ideal opportunity to showcase to your brand and reward your loyal social media followers,” Mandy says. The sweepstakes is open until March 30th at midnight and can be entered from the yellow sweepstakes tab on Mod Girl Marketing’s Facebook page at http://www.facebook.com/mod.girl.marketing.